Sweeney Chevrolet Buick GMC - Page 9 of 9 - Automotive News, Local News and Much more! I have 5 car leases and I had one come up for renewal and went to Sweeney. I called Sweeney and Frank Dilanni took my call. Frank treated me as if I was sitting across from him at his desk. Frank took me seriously and did what he could to get me the deal I wanted, not what a salesman would want. I would go back to Frank 10 times over and would recommend anyone I talk with to go see Frank. Every social media my kids have will ring praise for Frank Dilanni and the Sweeney family. Thanks Frank!!!!! Next stop…Showrooms! 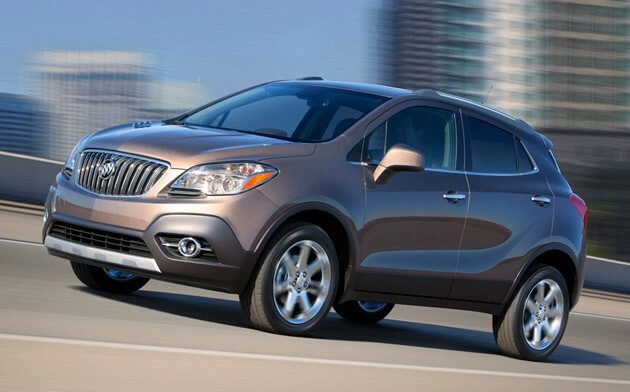 The Buick Encore will be here soon! Last year we were the first dealership in the Youngstown area to bring you news of the all new Buick Encore releasing sometime this year. Well, we’re pleased to report that within the next few weeks, you will be able to get your hands on the all new crossover. The 2013 Encore is unlike any other vehicle in Buick’s 110 year history, offering a unique combination of size, efficiency and value. In fact, the Encore is so anticipated that Autotrader.com recent named it to it’s “Top 10 Must Test Drive Vehicles for 2013″. They said that it’s a Nimble crossover SUV with an exceptionally quiet ride, a high-tech interior and estimated highway fuel economy of 33 mpg”. The suggested starting price of the Encore is $24,950 and an EPA estimated 33 mpg on the highway. Standard features include IntelliLink, 10 air bags, a rear backup camera, Forward Collision Alert and Lane Departure Warning. For more information on how you can be the first person to test drive the Buick Encore, give us a call at 330-Sweeney or email us at [email protected]! Sixty years ago, onlookers lined up on Park Avenue in New York City waiting to get their first look at the car that changed the way we view sports cars. They were waiting to see the first generation Corvette on display at the General Motors Motorama show. Well, 60 years to the day, the Corvette returned to New York in a big way. The original 1953 Corvette as it was produced. The 2014 Corvette remains true to its roots as a two seat sports car. It will deliver an engaging driving experience through very advanced engineering and lightweight materials. New technologies are supported by influenced design and features engineered to work cohesively and deliver the most connected driving experience in the nameplate’s history. The Stingray is also going to be the most powerful base model ever. Featuring 450 horsepower and a 0-60 time of less than 4 seconds. Not to mention, it will have a fuel economy of more than 26 mpg. The Corvette was originally championed by GM’s legendary styling director Harley Earl who insisted there was room for an American entry in the European-dominated sports car market. It was also his idea for Corvette to have a fiberglass body. The 1953 Corvette had a base price of $3,498 and offered only two options – a heater for $91.00 and an AM Radio for $145. Every Corvette has used innovative materials, like fiberglass in 1953 to the advanced carbon-nano technology and carbon fiber of the 2014 Stingray. A V-8 engine was first available in 1955. That year, it was selected by 90% of everyone who purchased one. After that, the V-8 became the standard engine on the Corvette. The Stingray name was first used for a prototype race car, the design of which influenced the second-generation Corvette that debuted in 1963. The ’63 Stingray split-window coupe has since been called one of the most beautiful and influential designs in the automotive industry’s history. Corvette’s legacy of mainstreaming technology was previously reserved for high-end luxury cars. This includes the introduction of fuel injection in 1957, independent rear suspension in 1963, four-wheel disc brakes in 1965, antilock brakes in 1986 and a tire-pressure monitoring system in 1989. Corvette is the longest running, continually produced sports car in the world. Nearly 2 million Chevrolet Corvettes have been sold since it went on sale in 1953. In 2012 the Corvette accounted for approximately 1/3 of all sports car sales in America. Just in case you haven’t seen the 2014 Corvette yet…Take a look! Meet the 2014 Chevroelt Corvette C7! Five Chevrolet performance cars, including the first production model of the 2014 Corvette Stingray raised $2.14 million at the Barrett-Jackson Scottsdale collector car. Proceeds will benefit the College for Creative Studies in Detroit, Habitat for Humanity Detroit, the American Heart Association, the Guy Fieri Foundation for Inspiration and Imagination and the Achilles Freedom Team of Wounded Veterans. The 2014 Stingray (with a VIN ending 0001) netted $1.05 million for the charities above. This came just days after the Stingray made its debut at the North American International Auto Show. The car was purchased by NASCAR team owner Rick Hendrick, with the proceeds going to the College for Creative Studies. GM Chairman and CEO Dan Akerson’s Regal Turquoise 1958 Corvette – Sold for $270,000 with funds benefiting Habitat for Humanity Detroit’s efforts. A 2012 Chevrolet Camaro COPO Convertible was sold for $400,000 benefiting the American Heart Association. This is the very last of the 69 COPO Camaro drag cars built for 2012. There were only 2 convertibles built, and this is the only painted Inferno Orange Metallic. Chef Guy Fieri’s personalized 2013 Corvette 427 Convertible Collector Edition sold for $270,000 and will benefit Cooking With Kids, a program by the Guy Fieri Foundation. A 2013 Camaro ZL1 Convertible, the first Convertible ZL1 off of the assembly line sold for $150,000.00. This money will go to the Achilles Freedom Team of Wounded Veterans which will help injured veterans compete in mainstream athletics. Take a look at these great cars! The First Retail 2014 Corvette Stingray sold to NASCAR team owner Rick Hendrick for $1.05 million. The money will benefit the College For Creative Studies. The only 2012 COPO Camaro Convertible in Inferno Orange Metallic sold for $400,000 will benefit the American Heart Association. GM CEO Dan Akerson’s 1958 Corvette sold for $270,000 will the funds benefiting Habitat For Humanity Detroit. The first 2013 Camaro ZL1 Convertible off of the assembly line. The car sold for $150,000 and will benefit the Achilles Freedom Team of Wounded Veterans.